We don’t post recipes very often (it’s on the to-do list! ), but this recipe was such a gem I just had to share. This is a foolproof recipe which yields beautiful, delicious results. I was curious as I’ve never made a fruit tart or galette where the flour wasn’t incorporated into the fruit in some manner. 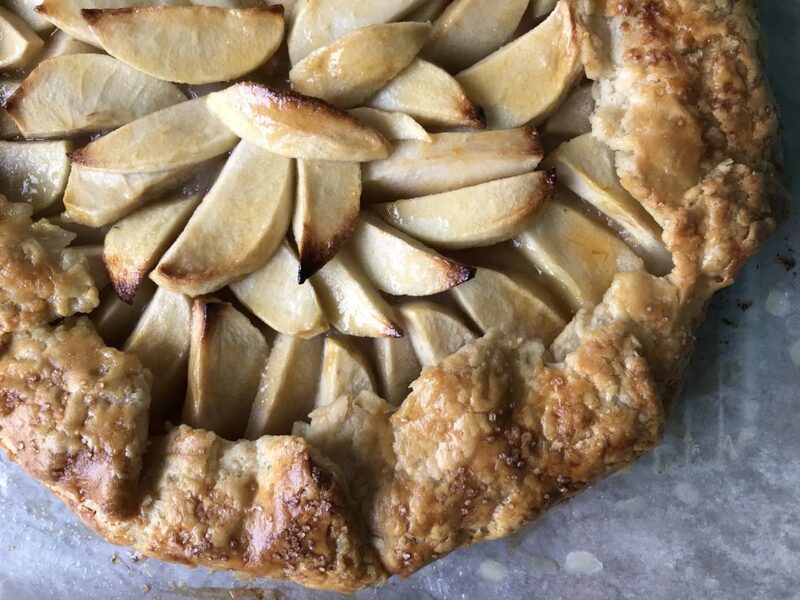 In this recipe, written by Master chef Jacques Pépin & Food & Wine’s Grace Parisi, the flour & sugar are sprinkled on the pastry under the fruit prior to baking. The only thing I did which deviates from the recipe is that I egg washed the pastry & sprinkled with coarse demerara sugar after chilling the assembled tart and prior to baking. I’ve written the recipe below, but here is a link to the original from Food & Wine. In a food processor, pulse 1 1/2 cups of the flour with the salt. Add the cold butter and process just until the butter is the size of peas, about 5 seconds. Sprinkle the ice water over the mixture and process just until moistened, about 5 seconds. Transfer the dough to a lightly floured work surface and knead 2 or 3 times, just until it comes together. Pat the dough into a disk. On a lightly floured work surface, roll out the dough into a 16- to 17-inch round about 1/4 inch thick. Line a large unrimmed baking sheet with parchment paper. Roll the dough around the rolling pin and unroll it onto the prepared baking sheet. In a small bowl, combine 2 tablespoons of the sugar with the remaining 1 tablespoon of flour and sprinkle over the dough. Arrange the apple slices on top in overlapping concentric circles to within 3 inches of the edge. Fold the dough over the apples in a free-form fashion. Brush the apples with the melted butter and sprinkle with the remaining 1 1/2 tablespoons of sugar. Refrigerate the unbaked tart until slightly chilled, about 10 minutes. Preheat the oven to 400°. Bake the tart in the center of the oven for 1 hour, or until the apples are tender and golden and the crust is deep golden and cooked through. Brush the apples with the melted preserves. Slide the parchment onto a wire rack and let the tart cool slightly before serving. The baked tart can be stored overnight at room temperature. Reheat in a 325° oven before serving.